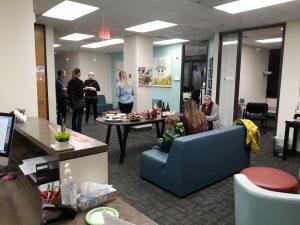 We were delighted to have the opportunity to host an open house and have that rarest and most wonderful of human interactions: face-to-face chats with referring providers and clinic friends. Over appetizers and drinks, after a long and satisfying work day at the clinic, Jenny, Alice, Christina and Lauren sat down and spent quality time talking with dental/orthodontic hygienists about OMD; pediatricians about our feeding clinic services, what OTs can do, and the nuances of neurodevelopmental speech and language therapy. We do love to talk. We’re grateful to those who came and spent time with us after their busy work days. And we have so much gratitude for all the folks who regularly refer new clients to our clinic. We’re always happy to talk with you or answer questions such as which insurance networks we are in (Blue Cross, Moda, PacificSource, and Kaiser for speech only, by referral), or if we see adult clients (yes! ), and what speech therapy has to do with feeding/swallowing. We are additionally grateful for the kind feedback from providers and families either via online reviews or when someone says call us first. Know that we will listen to you and always meet you and your family right where you are. And we’ll help you find a different place if we’re not the best fit. With Thanksgiving coming up next week, it can feel like you’re about to hop on a crazy-busy train that starts with all the shopping and horn-of-plenty food prep. And that train doesn’t stop until you run the gauntlet of the December holidays and ring in the new year (Hello 2019! We know you are just around the corner!). Wild ride, train wreck, or a little of both? We’re taking this moment of grace right before Thanksgiving to remind ourselves to be thankful for all that we have, and all that we receive from you. We appreciate every kind word about us and every single referral. Wishing all the best to you and yours this November and every day.